Could this modern take on a classic compressor design be fab for your studio? Like the compressors famously used in EMI’s Abbey Road Studios, and rather less famously in Joe Meek’s studio and elsewhere in the 1960s, Seattle-based Grove Hill Audio’s Liverpool Tube Compressor took the Altec Lansing 436C variable-mu circuit as its starting point. While Fairchild compressors may have been more desirable at that time, they were prohibitively expensive, and while the Altecs weren’t perfect, they were, by comparison, affordable. Thus, several engineers procured and modified the Altecs, often quite heavily. That’s essentially what Grove Hill have done here: they’re careful to point out that this is not a direct clone of any particular modification; instead, they say, they embraced the spirit of the engineers of that era and came up with their own take on this classic compressor circuit. The result is an all-tube feedback design which utilises a 6BC8 dual-triode remote cutoff ‘mu’ tube to achieve its gain reduction. This tube is re-biased by a tube-rectified (6AL5) side-chain control voltage, which causes the mu tube to change its mutual conductance or amplification — thus reducing the gain of the audio signal. High-quality NOS (new old stock) tubes are employed, and the rest of the electronics appear to be of a high quality, including some large custom-wound transformers on the input and outputs. Naturally, all this adds up to a quality signal-path and one that oozes retro vibe and character. That said, the Liverpool’s designers were keen for it to be more flexible than its forebears, and generally more suited to modern recording scenarios. The input gain control acts immediately after the input transformer and, despite the presence also of a dedicated threshold control, the input provides the primary means of achieving gain reduction (a higher input obviously makes more of the signal exceed the threshold). In fact, you can dial in compression without the threshold control engaged at all. While that might seem a little counter-intuitive, in practice it allows for more precise control than just relying on the input level alone. Not only does it mean that the Liverpool can accept a wider range of input signal levels than most vintage gear, but juggling the two controls allows you to fine-tune how much harmonic distortion is added at the input stage. And as the threshold control is advanced, while it obviously brings down the threshold, it also increases the compression ratio, from 2:1 to 4:1. Both the input and threshold controls are switched, to allow recall and precise matching of settings when configuring two units as a stereo pair (see the ‘It Takes Two’ box). Even more intriguing are the time-constant controls. The stepped attack knob offers six settings, covering a wide range from 1 (‘Fast’, 3ms) to 6 (‘Slow’, 138ms). Between each attack setting there’s a position labelled ‘C’ and this turns off the gain reduction completely. You could think of this as a bypass, but it has the pleasant side-effect of turning the Liverpool into a wonderful line amp. In the middle of the front panel sits a large back-lit VU meter which is not mere eye-candy; it provides a very clear visual guide as to how much gain reduction is currently being applied. There’s no option for metering input or output levels, though (there’s only gain reduction on offer) but below the meter there’s a small trim pot to recalibrate it, should that ever be required. The ‘C’ positions in between the attack settings switch off the gain reduction, effectively turning the Liverpool into a characterful line amplifier. The recovery (release) control determines how quickly the signal ‘recovers’ after compression. This has a very interesting feature, which might at first prompt many modern-day engineers (like me!) to scratch their heads. Back in the day, it was very common for this kind of compressor to be used to apply as much as 20 or 30 dB of gain reduction. That might seem quite a lot, but it’s important to understand that when this much attenuation is applied by a vari-mu design such as this, it’s not transforming the signal in the way a faster solid-state compressor would. Rather, it ‘pins’ the signal in place. This wasn’t just useful from a sonic-shaping perspective: it helped engineers achieve a healthy recording level without hitting the tape too hard. In between each of the stepped recovery settings, there’s a Hold facility, which acts as a sort of ‘primer’ for the compressor. The idea is that, one you’ve set the other controls as desired, you set the Liverpool to Hold just before a song starts and just before it finishes. This prevents an audible ‘thunk’ as a sizable amount of gain reduction is suddenly applied to, for example, a bass guitar, and it stops the signal audibly swelling in level when the track finishes, and your 30dB of gain reduction is swiftly removed. (Yes, there really was a time when engineers had to do stuff once the record button had been hit and not just sit back and listen or look at their phones!) A stereo link facility allows two units to work in tandem. The day I received the Liverpool, I happened to have a band in for a live tracking session, so I decided to throw it straight into action on the bass guitar’s direct output. It took me a few minutes to get a feel for how the unit works, but the main thing I had to grapple with initially was my own caution due to what the meter was telling me: did I really have the guts to hit record while the meter of a unit I didn’t know told me I was applying a chunky 10 to 15 dB of gain reduction? Well, it certainly sounded transparent enough, so I did exactly that, and I was hugely impressed with the way it took what was quite a dynamic part in its stride. Smooth, controlling and with just a hint of tube saturation on the louder sections, it was everything I look for in a bass compressor. But it wasn’t just a personal preference: fellow engineer Matt also raved about his experience using the Liverpool on bass guitar for an album he was tracking at the studio. We both felt that once a bass part was in the DAW after going through this unit, it seemed almost good to go, with pretty much no additional mix processing required. On vocals it was a similarly inspiring story, though I found that it was more critical that I made sure I was hitting just the right spot in terms of how much gain reduction was being applied. Although I could really crank it up, I found that roughly 10 to 15 dB was usually about right for my taste when mixing, and a little less while tracking. Unfortunately, my time with the unit was briefer than I’d have liked, and I didn’t get a chance to give it a thorough workout on drums or percussion, but by way of assessing its worth on transient-rich signals, I recorded some acoustic guitar, and I have to say that the Liverpool did a great job of smoothing a rhythm part. I would be very happy to use the Liverpool on many guitar duties, both for its general sonic effect as well as for its dynamic control. Once I got to know the unit better, I began to appreciate the sonic character that was there even without any gain reduction applied. The ‘C’ control in between the attack settings enabled me to gauge what impact the gain reduction was having, of course, but it also allowed me to assess this sonic contribution, and thus decide to set the gain for very pleasing, subtle coloration, or perhaps to drive it slightly for a more obviously saturated effect. It’s always a bit tricky to put such things into words, and I usually try very hard to avoid overused — and often misused — descriptions like ‘warm’, but if any device warrants it then this does. Anything that’s passed through it comes out the other end sounding a little sweeter and smoother, but not in an overly coloured way. A peep under the hood reveals the custom-wound Cinemag transformers and NOS tubes, sitting amongst other high-quality components. I thoroughly enjoyed my all-too-brief time with the Liverpool. It has clearly been very carefully conceived to bring the flavour of the older designs that inspired it to a new generation of users who have different demands. The price is a significant consideration — while it’s not exactly an impulse purchase, it’s considerably cheaper than the vintage originals and, for that matter, most comparable modern compressors of this quality. Once I got used to the controls, I really began to appreciate what it might give me were I to acquire one for my studio. I liked it so much on bass guitar that I’d consider purchasing one for that purpose alone. While that might sound like an indulgence, I can easily imagine it seeing plenty of use on various other sources during both tracking and mixing too. It’s a genuinely creative tool that can offer you a different take on a sound simply by patching it in and dialling in a little compression. That said, quite often, I’d be happy to use it just for colour and not for any compression whatsoever. What it is not, by any stretch of the imagination, is a surgical tool: setting it precisely can be a little tricky, and it always adds character, whether you want it or not. But while it’s in no way ultra clean-sounding, it’s hard to think of many scenarios where its gentle sweetening effect would be detrimental, and for subtle level smoothing during tracking pretty much anything, it does a great job. In short, then, this is a great-sounding, creative, and characterful compressor that doubles up as a wonderful line-amplifier. It (or better still, a pair of them) would provide a perfect analogue front end in a small recording setup, and would see plenty of use in a more conventional studio setting. Vari-mu compressors have regained popularity in recent years and there are now various options to choose from. Chandler Limited’s RS124 is a painstaking recreation of the Abbey Road units famously used on so many Beatles recordings. 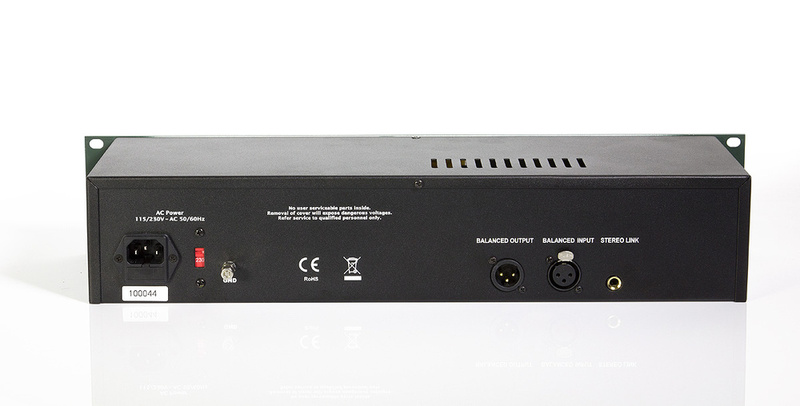 Phaedrus Audio’s more affordable and compact Phamulus has its origins in the Altec 436 circuit. Different variations on the vari-mu theme include Manley’s Vari-mu, Retro Instruments’ 176 and Tegeler Audio Manufaktur’s new Schwerkraft Maschine. After I’d had the pleasure of using the Liverpool compressor, the review unit found its way up to producer Steve Levine’s studio in, rather appropriately, Liverpool, and I spoke to him about his experience. Steve had already been auditioning one of these devices but was keen to use two units to perform stereo processing duties for a live recording he was due to make at 2016’s Psych Fest. Steve described the stereo function as being very easy to set up and use: a jack cable is used to connect the units, and each then operates on a summed side-chain control voltage — so the only quirk is that you’ll need to back off the input level on each unit to get the same gain reduction as when operating stand-alone. More generally, Steve was obviously as impressed as I was, including by the sound of the unit when it wasn’t actually applying any gain reduction. For his festival project (the result of which you can hear at https://vimeo.com/184494766), Steve tracked the drum overheads through a pair of Liverpools, and later, when mixing, deployed them on the toms. One thing that’s worth mentioning is that Steve was also keen to point out just how quiet the unit sounded when compared with some of his other high-quality outboard. 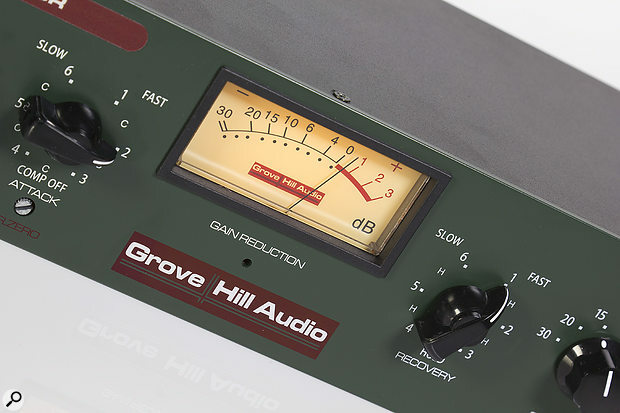 Great-sounding tube compression — even at very high levels of gain reduction. Pristine, but gently flattering, signal path that can also be driven into coloration. Slightly quirky controls that feel creative both when recording and mixing. Sometimes a little tricky to get just the right amount of compression, especially on louder sources. 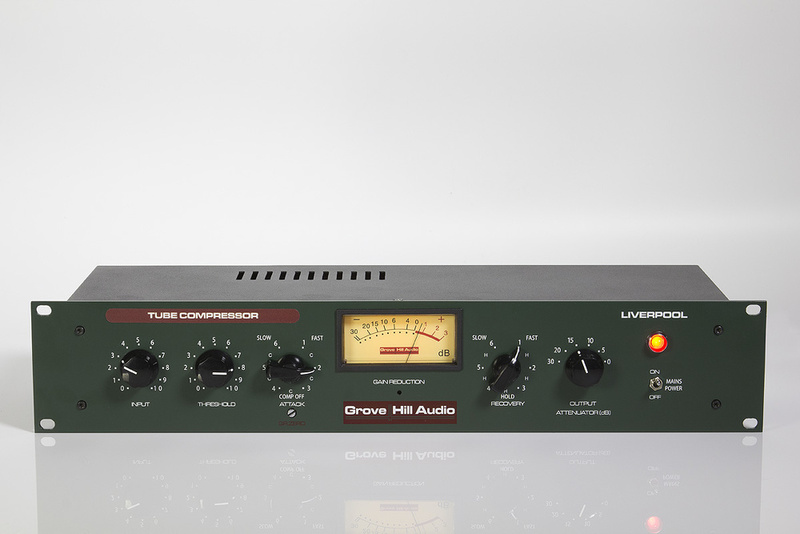 Inspired by some classic compressors from a golden era in recording history, Grove Hill Audio’s Liverpool Tube Compressor brings a highly usable taste of those classic designs to a new generation of users. It’s capable of subtle and not-so-subtle levels of smooth, transparent tube compression as well as pleasing tone-shaping options as a line-level processor. $1295 plus tax and shipping. Grove Hill Audio +1 425 295 7795.